Get ready for all the demographic data and election analysis your political heart can take. 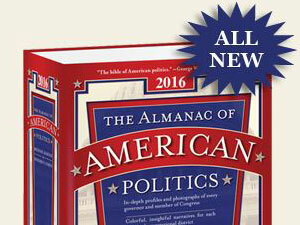 The 23rd edition of National Journal’s Almanac of American Politics will arrive this summer, an effort that will be headed up by author and journalist Richard E. Cohen. Cohen is a familiar face on the NJ Almanac circuit, having served as co-author for editions published between 2001-10. Ballotpedia.org senior writer James A. Barnes and NJ magazine political analyst Charlie Cook will co-author the Almanac. The Almanac promises to offer a comprehensive look at the 114th Congress, combining encyclopedic biographical histories with heavy-duty stat and data compilations on each member of the 114th, as well as the governors of every state. New for this year, and likely to be stomach-churning in this post-Citizens-United electoral landscape, is campaign finance data that will look at how much candidates spent in the last election and the “outside money” that contributed to their effort. Earlier this year there was some doubt the Almanac would survive through another edition in print form as the National Journal searched for a new publisher for the book, but it found one in Columbia Books & Information Services, an experienced publisher of Washington- and government-related handbooks.